If these grey, socked in kind of days are causing a serious spike in your spaghetti cravings, you’re not alone. One of my favourite spots to splurge on this Italian staple is Ask for Luigi in Strathcona Village’s Railtown. JC Poirier, owner and chef of this tiny restaurant on the corner of Powell and Gore, is passionate about creating the best tasting food possible. 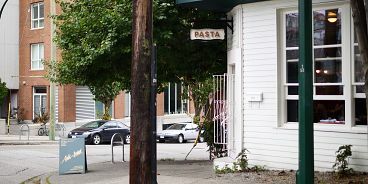 Every day, he and his team make their pasta from scratch. It’s fresh, soft and noticeably better than the packaged version. Their Spaghetti Nero with octopus and grilled jalapenos is my favourite dish on the menu, and recently I was lucky enough to interview chef JC about his dish and how on earth he gets it to taste that good. One of the secrets is to save your pasta water and use it when you’re finishing your spaghetti in the pan. Also, a drizzle of GOOD olive oil on the finished dish is an absolute must.